If anyone had told me that it would be possible for me to build a website in a day, I would automatically have said ‘impossible’. Perhaps someone who knows what they’re doing, could do that, but I don’t fit into that category. Wrong! 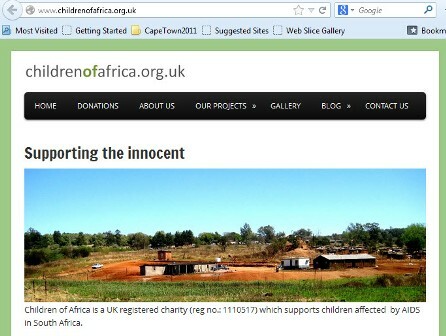 And to prove it, here it is: the first draft of our charity website. It is up and running, although not complete. But I hope it will be within the next few weeks. Just in case you need to confirm what I am saying is true, you can check it out for yourself by going to www.childrenofafrica.org.uk. Social Media links. Adding the buttons is easy enough to do, however I need to set up the accounts that they link to. Content. And of course, most importantly, I need to add some good content. But a huge thank you needs to go to Jamie from Pootlepress whose demystified the WordPress world at his course I attended last week. Without him, and access to his Pootlepress Academy, this process would have been a lot more difficult!